Sitting here waiting for the first snow storm to hit of the year I thought it was time to post an update. As of right now I haven’t moved forward with anything. I have no plan because I really don’t know where to start up again. All my labs are all set to go, but getting that extra push to start again is becoming non-existent. Maybe it is the holidays? What material do I use, where do I start, do I want to start? Throw into the mix that my wife found out three weeks ago that she is pregnant – the pressure is on. There is no way I am going to be able to dedicate my time to studying once a newborn is here with a two year old running around. There is going to be very little lab time. Jake is a energy filled boy, he is non-stop and always on the go. First of all I would like to apologize for the delay. Secondly, please excuse any typos, I kind of rushed to get this out so you guys will enjoy the lab. Once again there are no registrations, no sign-ins or any other requirements to download the lab. 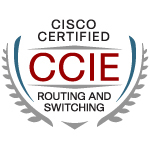 And then, click on *CCIE Routing and Switching Trouble Shooting Workbook* and then, click on *Download FREE sample chapter*. Please let me know if you experience any problems. The initial config file is also included. You need to have winrar to unzip the directory, it also includes the diagrams. This lab is one of the 10 Troubleshooting Mock labs and hope it would NOT be a waste of your precious time. PLease go through and read the answers and see the steps that one has to go through to resolve a trouble ticket. I have also included another FREE lab work book that you guys can download; it has 338 pages of good labs (They help reduce your blood pressure, whereas, the TS labs help reducing the cholestrol). You should see it there as well. The security work book and the SP will be our next priority and they should be completed before the end of the year. There will also be a FREE VOD on ZBFW, that should be finished within a week or so. Enjoy and I hope to see you guys later. YES! We take Cisco Learning Credits! Right now I don’t think anyoneâ€™s troubleshooting workbook is going to help you out. You either know the material and how to troubleshoot or don’t. I really need to keep fresh or I risk losing alot of the material I had in my head four weeks ago.